It is cold outside and there is nothing better when it is cold out and cold season is in full swing than a great bowl of homemade chicken noodle soup! I have been doing a ton of freezer cooking before baby arrives and I used my slow cooker chicken noodle soup recipe to make up a big batch of homemade soup and freeze it for eating later. You can check out all my freezer meal recipes if you are looking for yummy freezer meals that don’t include things like hamburger hot dish (yuck!). Now on to the super easy and delicious Slow Cooker Chicken Noodle Soup recipe. 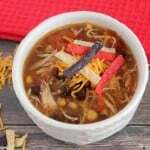 Throw this all in the crock pot in the morning and by dinner you will be enjoying the delicious soup that simmered all day and filled your home with yummy smells! Easy slow cooker chicken noodle soup recipe that also freezes well for eating later. 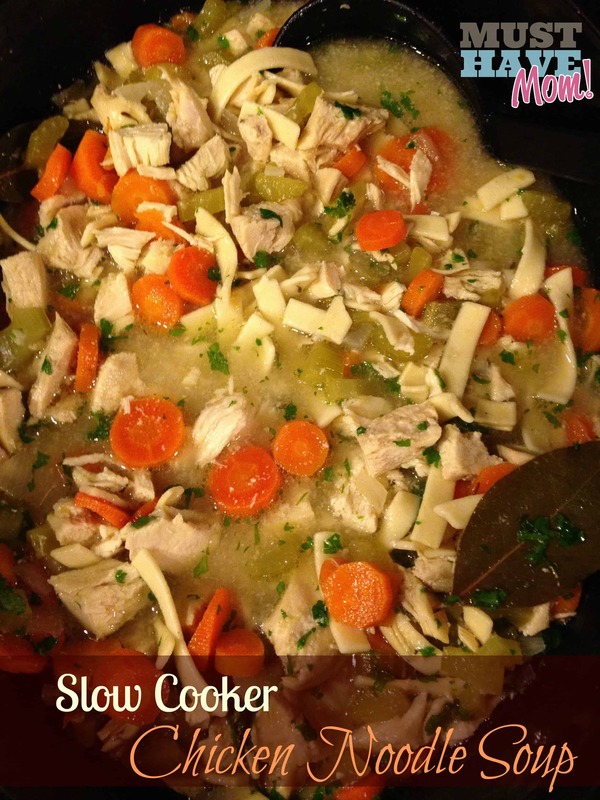 Place chicken breasts (raw and whole), carrots, onions, celery and garlic into slow cooker. Add broth, water, thyme, celery salt, and bay leaves. Remove cooked chicken and dice while warm. Add noodles and parsley to slow cooker and turn up to high heat. Cook until noodles are al dente (especially important to undercook them if you are freezing the soup for eating later so they don't end up mushy when you reheat it) about ten minutes. Stir in lemon juice and add chopped chicken back to slow cooker. If freezing: allow to cool and then transfer to gallon zip top freezer bags. Double bag and freeze flat. Thaw. Reheat on stove or in microwave until warm. « Appaman Mini Collection Brings Big Fashion To Little Boys! Wow, this looks so good. I wish I had a pot of it bubbling in the slow cooker now! 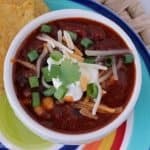 This looks so delicious and I love slow cooker recipes! I love chicken noodle soup. There is nothing better than home made soup too!! The cost of canned soup is horrible and this would be so much better tasting and economical too! Thanks for the great idea and I like how you heated it up!! 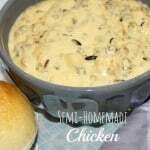 Slow cooker recipe are my go to! They are quick, easy, and save me a ton of time. And this recipe is a keeper! Looks awesome! 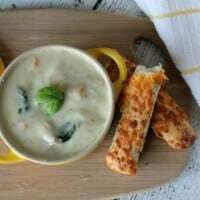 This looks like one delicious pot of soup, one I may try since I could do this, go to work and have dinner ready when I get home for the kids. Can you cut the time in half and cook on high? 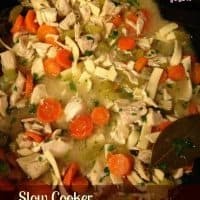 This is awesome having a great chicken soup recipe for the slow cooker.I love making my own egg noodles.Thank you for posting this. Oh, homemade egg noodles would just make it so much better.